The above painting is under copyright protection. Copyright c. 2005. All rights reserved. The Primitive Baptist Library. 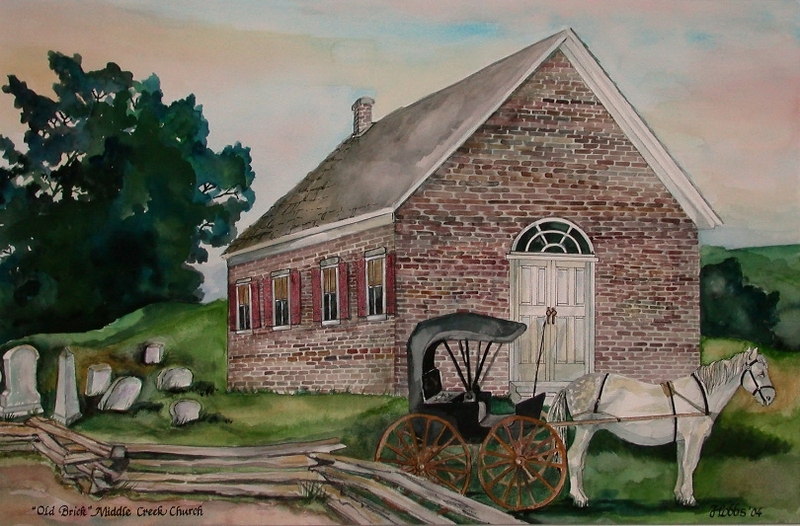 A watercolor painting of the Old Brick Church has been made, by Pat Hobbs, an artist in our area who was commissioned by the Kibbe Hancock Heritage Museum in Carthage for this painting. The Kibbe Museum purchased the painting and graciously gave it to The Primitive Baptist Library, and Mrs. Hobbs gave the rights that go with the painting. Prints and cards of the painting may be purchased from Crooked Creek Galleries, South Side of the Square, Carthage, IL 62321, or from the Primitive Baptist Library. Middle Creek Church was organized in August 1832; it was the first church of any denomination organized in Hancock County. There were thirteen charter members, who were constituted by a presbytery composed of Elder William Bradley, Elder John Ray, and Lic. Thomas H. Owen. They met at first in homes or in a log school. In 1841, a brick church building was erected, of hand-made bricks burned at the site. As the years passed by, the church became known in the community as the "Old Brick Church." Burials were made in the cemetery in 1841 (or earlier). The Old Brick Cemetery became the burying ground for the Middle Creek community. Most of the funerals were conducted by the pastors of Middle Creek Church, but others, such as William Booz of the Christian Church, also conducted funerals there. The Old Brick Cemetery was sometimes called the Middle Creek Cemetery, and sometimes the Elm Tree Cemetery. The Old Brick Church was torn down in 1892, being considered seamed and unsafe, and a new frame church was built the same year, about a mile south, over the line into Harmony township. However, the Cemetery continued to be used for many years afterward. Middle Creek Church ceased to meet in 1979, and the remaining members sold the frame church building to private individuals on July 20, 1987. From 1841 until 1899, the Cemetery was owned by Middle Creek Church. In 1899, it was deeded to three trustees as representatives of the "neighborhood" or "community." In 1907, a chancery court interpreted the ownership by the "neighborhood" to be the county of Hancock. In 1920, these same three trustees, together with three other men in the community, became the founders of the Middle Creek Cemetery Association, and received the Cemetery by deed from the county of Hancock. In 1959, three members of Middle Creek Church, acting as trustees of the Middle Creek Cemetery Association (which had been inactive), deeded the Cemetery to Carthage Township. In September 2008, Carthage Township deeded the Cemetery back to the Middle Creek Cemetery Association, which had been revived in 2004 to restore the Cemetery. The Old Brick Church was built just a few feet from the stagecoach route. It was called the State Road from Rushville to Carthage, the seat of justice in the newly formed County of Hancock. The Illinois General Assembly ordered this road to be layed out in 1833. State law apparently also made the township section line a public road, so there were two roads to the site for many years. The old state road disappeared from official maps in about 1940, but no record has been found to show that it was ever formally vacated. In 1951 an attempt was apparently made to vacate the other road to the cemetery, a north/south township road on the section line, and the township has considered this road closed since that time, even though the legal description given in the proceedings to vacate the road were wrong. In the fall of 2008, the only paths to the cemetery, from the north and south, were tilled up. A survey, and an easement, for a new access from the south has been promised but is not completed; hence, at the present time there is no actual access to the cemetery. Due to heavy rains in the spring of 2009, access across a muddy field was impossible until July 1, and then we were not able to mow it. Finally, after the landowner mowed the east end with a farm tractor, we were able to mow the entire cemetery on August 24th, with a riding lawnmower. In 1873 Middle Creek Church authorized Ambrose Bryant, a member of the church, to sign deeds for the sale of lots. A plat of the cemetery had probably been made prior to that time. A blueprint was evidently either made or still existed in 1927, at which time lots were still being sold. Lawrence D. Lane was president, John H. Long was secretary, W. N. Reno was vice-president, and Marion "Doc" Munson was treasurer, of the Cemetery Association, in 1920. The other trustees were John T. Bryant and Asa Kimbrough. Funds collected for perpetual care, in the 1920's, were probably lost in 1932, during the Great Depression, when the Dime Savings Bank failed. The plat or blueprint, or burial list, was never recorded at the courthouse, and no one seems to know what has happened to it. Without the blueprint, there is no way of knowing who is buried in the many unmarked graves. If anyone knows or learns of the existence of old burial lists, or of the plat or blueprint showing the burials in the cemetery, or if anyone finds a copy of any deeds for lots, please contact us immediately. The Middle Creek Cemetery Association held its annual meeting in August 2008, and elected officers. The Secretary-Treasurer was authorized to sell grave spaces. Email address is shown at the bottom of this page. There are photos in the links below, which show the condition of the Old Brick Cemetery before and after 2004, including recent restoration work. Since the cemetery now belongs to the Cemetery Association, its expenses must be met by private contributions. Anyone wishing to help with the restoration should make donations payable to The Middle Creek Cemetery Association. Our sincere thanks to all who have helped in any way with the restoration of this historic site.